Photo: Rony, 13, was rescued from malnourishment and abuse 5 years ago. 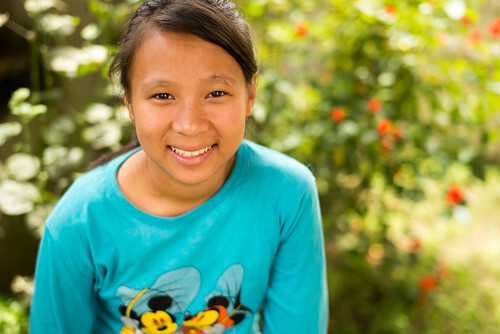 Her life has radically changed and now her future is full of hope. “My name is Rony. I am from Makwanpur district. I’m belong to Chepan community. Today I’m going to write about my life that how I spend my life when I was small. I have my mother, father, two big sisters and me and small sister. When I was small there were only two big sister. There was good relationship between my mother. My mother have gave birth to my small sister. Mother was very helpful and used to work hard for my family. She was a tailor. Father used to worked in a field. One day, after many years she again gave birth she was just a girl. From that day my father started to drink alcohol and used to come at night. He started to fight with my mother and he scold my mother by saying bad words and mother also started to fight. Small sister was very small. She used to cry at night. One day, in the morning, I woke up and I heard that my mother has leave us. I was very sad. She went far from us. My father search but he didn’t found. From that day I never saw my mother and also I didn’t saw my second big sister. Her name is Romu. In the there was me and my small sister and big sister. Some time big sister used to go in my grandparents. Most of the time she used to stay with father. All the time I have to cared my small sister. Most of the time father used to come late at night because he used to work in others house and he used to bring rice and other things for me and small sister. Then there was no food at home. We were so hungry and me and sister went in others field and we ate raddish, carrot, and used to sleep in the kitchen. When father used to come, some time he used to drink alcohol. When father was not at home we used to feel very unhappy. When my mother was there it was very happy and all the things were good for me. Some times at night small sister used to cry and used to say that I’m too hungry. When she said I felt very sad because there is no food in house. I have stolen many things from others field. One day from Narayanghat one phupu came and said to my father that was married stepmother. And my father married and we were so unhappy. She is used to love her own daughter and some time she used to beat us. When father used to come and used to call us and used to show that how much she loved us. Most of the time father used to go out and stepmother used to scold us. All the day I have to worked hard. I have to wash the dishes even I have to cooked food. Stepmother was very bad and she used to give her own daughter food and good dresses. It was very tough for me and sister. We used to go in others field to stole the food. We used to sleep in the kitchen. The main thing was that there was no slipper in my foot and small sister’s foot. I asked my stepmother about my mother she used to say that the is already death and I’m your mother. And I felt very bad. When we used to asked about my mother she used to beat very much. In Dashain and Tihar I used to go in Mamaghar and asked my mama about my mother she said she will come don’t worry. And I used to feel very happy because my stepmother used to give many trouble to me and two sisters. When stepmother heard about my mother she also leave my father and went away. Roma did also come from Kathmandu and she stayed with us. When mama said that and I also told my neighbors about my mother. My mother came in Mamaghar and my big sister took us with mother. Now father is staying alone in village. But more than my mother I love father because he had cared us when we were small when he used to beat sometime only. I think have done many hard works but can’t remember. I have wrote here only main things. We are grateful that Rony came to live with us because due to the crippling effects of extreme poverty and disease in Nepal, millions of children are orphaned, often falling victim to child prostitution, human trafficking, or forced labor. Peace Gospel’s orphan homes in Nepal act as safe harbors in the midst of this darkness, offering orphans a way out of the dead end of despair and hunger. Through the work of our organization, these precious children are provided a loving home centered on Biblical principals of God’s love for them. In other good news, the economic blockade unofficially imposed on the people of Nepal by their neighboring country of India, which severely affected our native team, has finally lifted after India decided to end the conflict in February. The economic blockade involved many protests that blocked the main points of entry for goods from India, such as fuel, cooking gas, and vegetables, thus leading to crippling shortages of these items in Nepal. Our team is still suffering shortages in fuel, which has spiked to high in price, and cloth for our girls in the ‘She Has Hope’ rehabilitation home to make plush stuffed elephant toys which we sell on our Etsy shop. With your support and contributions from our generous donors, we are seeking to raise $465.00 to enable our native team to buy fuel, cloth, and other essential items to meet the needs of our programs. We look forward to reporting back about the normal flow of things returning to the lives of our girls, our orphans, and our native team. Thanks for your faithful support and the generous contributions from our donors — every little bit helps to give our girls and orphans a life full of joy and hope.